Bloody Porto, that is all. fully agree about this wretched script, as soon as I scored against KVC Meirkuguart last night it was literally impossible to keep the ball. Even with a clean win of the ball my defender’s momentum would carry him into another of my players who changed direction to wander into the way, sending the ball back on its inexorable route into my goal. And KVC Meirkuguart are no Arsenal. Not convinced this is any worse/different than PES2012/13 though? Also managed to sign a new RB who I am very excited about! Lloyd – unlucky, and it’s that forever quest for a Treble that I want to avoid with PES2014. abbeyhill – in this one instance of scripting it does often seem to me that PES2014 not letting you keep the ball after you take a lead is the worst I’ve come across in PES. Or it seems worse on account of the game’s cumbersome mechanics. When the AI chases you down in this PES there’s no escaping them for long. NG – gutted. After last season’s the league I really thought 6 trophies was on. Ended up with 5. 2 games later this happened and I felt a lot better. Once more into the breach dear Lloyd….does missing out on the sixth mean you can’t go for six next season? Presumably it’s the CL so that would mean another two seasons to do the big collection? Keep going n-G. Surely the next PES will see Chelsea a little more “human” as they have been portrayed in recent PESes. They’ve still only conceded two goals in 18 games of my current stuttering PES 2016 ML season. Speaking of which, I might try and squeeze in a few games tonight. It’s been a while. Turf – yep, two more seasons if I want to do the clean sweep. Got two other players on 99ovr, be nice to get them up to 100 as well. A few days break from Pro Evo to finish Metro: Last Light Redux in order I think. Did anyone watch the Leicester game on Sunday? For the first time since they became contenders I had a doubt that they could actualy do it. I picked up that there was some real nerves for once. I know the line given out was that it felt more like a win than a draw, but I don’t know and I can be wrong but the tensuion is going to mount and Spurs have nowt to lose. I feel so happy to read that pes 2014 is a cult classic.It was so misunderstood in its year that it would have crushed the soul of development team so much that we won’t now ever have a realistic football game.In this day and age of so many options for entertainment ironically most of the options are junk.This truly was a masterpiece where I at the age of 34(I was 34 when game was released)was able to beat most of the online crowd with footballing logic and not gaming logic if you know what I am saying.I found it so satisfying to be able to play football online.On most days I could have take any team in la liga and beat Madrid n barca .Now with any other games it’s not possible because u need faster reflexes in button smashing which kids have.After and before 2014 it’s almost impossible to beat a barca or a Bayern with an average team online against even an average player.The individuality in defenders was also brilliant.You just learn right stick defending and players like hangalad r a nightmare for forwards.Slow towering defenders were a treat to use. The variety of tactics and players you could use was outstanding.The most wonderful aspect of the game was that there is no sure shot way of scoring.If you are a goal down in a crunch game boy you then had to think fast and creatively.I also think that 2014 was a superior product on PC. Darryl – what I have to say is cynical, sacrilegious, and definitely a minority opinion, but I wouldn’t be bothered if Leicester did collapse, and Tottenham won it. Leicester are very average. Greece 2004 and all that. Leicester are a phenomenon that proves the power of collective belief. I remember when Norwich rode high and beat Bayern Munich at the Olympic Stadium. For Jeremy Goss 1993 read Jamie Vardy 2016. Leicester will be in the Championship again within 3 seasons – I wonder what betting odds I could get on that? Probably good odds, as the money they’ll get next season will hold them aloft, Blackburn-style, for a bit. But I also would enjoy it if Leicester held their nerve as it’d be a great story. Win-win either way for me. And no, there’s no Midlands rivalry in play. Leicester is too far away in the East Midlands. In the Midlands there’s a mental divide between East and West. Unlike East Anglia, where they’ve got that whole Norfolk vs Suffolk rivalry, the two halves of the Midlands are completely indifferent to one another. The rest of the country might consider Birmingham vs Nottingham Forest, for example, to be a derby game – nobody here does. That whole Leicester-Nottingham-Derby place ‘over there’ might as well be on the other side of the world. Jamiey – totally agree. PES2014 represents the road not taken. NG – I have never done the rivaly nonsense as when I followed Preston I could not give two hoots about what Blackpool did. You would be right to bet on that as look at the age of the Leicester side as there are too many players around the 29/30 age group, so the only thing that could possibly help them would be wise investment from Champions league money. Spurs on the otherhand have such a talented young squad that could possibly dominate football for years to come. I would love Leicester to do it as I will always lean towards collective belief but still acknowledge what a good side Spurs are. Show glimpses of brilliance at times but are bottlers when it comes down to the nitty gritty of scrapping for results. In their prime they were the best we have seen and dominated the game for long periods of time. It is not good to watch but still capable of grinding out results. Leicester – can’t beat yours as that is a good call. Great attacking but not capable of showing an all round defensive game as well. Going back to footy gaming it would be a shame not to give Fifa 16 a go as it is a massive leap from the great game Fifa 15 was and gets better the more you play it. I also didn’t realize that they have some grounds in from the lower leagues as I was playing at Fratton Park this morning. The thing that I imagine will work against Spurs in the future are the London derbies. I know there have been newer rivalries in recent times – Arsenal/Man U, Chelsea/Liverpool, etc but the number of high profile games that are played in London (and ultimately moved for t.v) must be a factor – like geography and rain in the cricket county championship – far easier to play games to a result in Surrey than it is in Lancs. I’m going to return to season 4 today. Last night I had a Skyrim dream, that’s a sign I’ve been playing a bit too much. Like one of those horrible Tetris dreams (come on, some of you must have as well?) I kept imagining a series of cave entrances and where I had to go. A short while ago I was getting back into ‘real’ football but even in this odd season it’s lapsed and the extent to which it has fallen for me is I didn’t even feel the need to play and listen to the Newcastle-Man City commentary – like NG’s apathy about the Leicester story it always comes back to one bunch of millionaires owned by some fund manager playing another. Badge kissing must be one of the most pathetic actions of recent times, it’s simply business now. On which I note the wheels have fallen off even with FC United, sad but seemingly inevitable. Turf – also if it was to go down to the last game of the season then Spurs would have to face Newcastle, who will probably need a result to stay up. I remain unconvinced by the Rafa effect on such a bunch of misfits and drifters and think it’ll all be over by then anyway. A shame as I think if he were to stay and have a summer to chase the majority of them it could be the start of a relatively steady period in the history of the club. He clearly doesn’t rate Shelvey – evidently he hasn’t heard that he’s the new Sibon! The story of Leicester is far more compelling than their football. They had the celebrated ‘3-0 up at Man City’ moment, but has there been another like it? I hope they do it to annoy the big boys, but I can’t make myself believe they’re worthy of it in the way that 70s/80s Liverpool, 80s/90s Arsenal, 90s/2000s Man Utd, recent Man City, and even Chelsea last year all were. Darryl – FIFA16 is 90% sure to be my next footy game in June or July (or whenever PES2014 winds down). As ever though FIFA will suffer from its position in the footy game year. I never have settled when coming to it in the summer. History shows my most successful FIFA stints have come at the start of the footy game year. NG – what is strange though is how long it has taken other teams to work out how to play against them as when you consider the games at the end of last season it is a fair old run they are on. It is a simple game they play, so you would have thought so. As for Fifa 16 a REAL treat is awaiting you I promise you that. What is your longest Fifa career? Seems you can soon add Swansea to that concentration of clubs in overseas business focused hands. If the working man’s ballet was ever true it isn’t now. Sadly when they get bored, or start to lose money you get Villa. Truly the latter years Alex Higgins with their tales of nights on the laughing gas. I concur with Leicester potentially doing a Blackburn. Ultimately it’s Leicester, not a terrible place but it’s not London or Manchester and that’s where the players seem to prefer, the money is massive wherever they go. You can only unearth so many rough diamonds, they’ll need to spend a fair bit of cash just to maintain their position. Notable that no one talks about Celtic or rangers joining the premier league any more. My tip for the next surprise challenger would be wondengine town, took some tractor boy to the cleaners I heard. Finally, season 4 a cup match victory. I’m having ridiculous amounts of possession – 70% v Everton, lost 0-2. Sunderland in the cup 68% squeaked through 2-1 aet. One thing I do think 2014 does poorly is the advantage, there isn’t one. On a couple of occasions the AI would have been through on goal but the after slide foul dragged the action back. Uncle Turf – I’ve never seen the delayed foul work against the AI, or against me. The game always waits for an outcome before awarding the FK. I think you only will ever see that happen a couple of times. I had a penalty today. I seem to get one every couple of sessions. Wonderful stuff, as are the festival of free kicks around the box that a typical PES2014 session brings – but we shouldn’t fall over ourselves to praise a football game for having something that no football game should be lacking. NG – I have always been a slider fanatic due to the pace of Fifa games as even on slow setting it still feels fast. Well I have come to the conclusion that sliders are not a good idea as they effect things in the game like stamina, which make a real difference to matches later on in the games. I am getting more acclimatised to the pace a bit. Darryl – you’ve convinced me as well to try FIFA16 as my next footy game! You probably wouldn’t find out abbeyhill, she takes privacy to new levels. I’m never really that surprised or fussed when celebs die but rather weirdly I remember exactly where I was when I heard James hunt had died. I have to say I’m finding my return to 2014 a joyless experience. I’m dominating games, absolutely running them at ridiculous levels of possession and yet in every game the opposition keeper is man of the match, 20 shots saved, 1 quick break and I lose 0-1. I’m not arsenaling either, I’m mixing it up completely, at times the AI can’t get the ball and yet it seems like I’ve encountered script 101, thou shalt not score – 1 goal in the last five league games. It’s odd but I’m also struggling with writing anything for my thesis or being bothered to watch any telly, must be some sort of post Easter holiday fug. On a positive note my tomatoes have started coming through in the greenhouse so warmer weather must be here. Uncle Turf – you must be doing it wrong(ish). 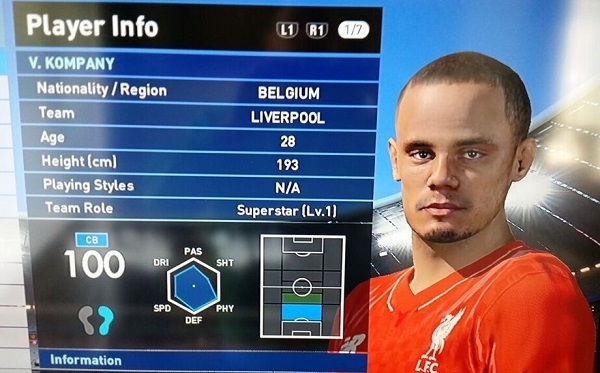 Although PES2014’s infuriating-ness is indeed one of its many faces. How do you tear a muscle in your back crossing a road? But granted its bloody painful, way more so than the description would gain sympathy. I don’t know what’s changed with 2014, I’ve improved my strikers by a good five points, retained most of my championship winning team, continued to exploit the corners, etc and yet the keepers are just insanely good, even from six yards out they are flying across goal to stop them. I wonder if my season 3 cruise to the title has knocked the AI up somehow, yet opposition outfield players are no great shakes, and I’ve been playing west brom, Fulham, Everton, et al ie. None of the better teams. I’m bottom of the league and yet feel like I could walk the ball up field at will. The absence of those more frequent long Rangers and headed goals are probably hurting as I’ve got no more options in the locker. Uncle Turf – because the leg bone is connected to the back bone. When I really need a goal in PES2014 I have to construct it so methodically that it hurts. One of today’s goals was a case in point: right-sided AMF setting off on a run down the wing. My usual thing is to sprint to the byline and send in a pull-back cross. Instead I hoisted in an early cross from deep. Keane trapped it on his chest about a yard outside the area, turned and passed to Serrano in the box, who shimmied one way, turned back the other and slotted a deft shot into the net from about 8 yards. Not my preferred type of goal – more your type I think – but it’s the sort I have to deliberately craft when I really need a goal. Funny enough I was reading a newspaper article (on-line) yesterday morning before the news of Prince broke and it was referring to the fact that a number of celebrities had died this year. It was saying because we now live in a celebrity culture we will soon be at the point where one dies every year as you have all these new celebrities as well is the legendary figures from the past. I can’t say I was the biggest of Prince fans though. My wife was though. Darryl – yes, I read something similar – that our grand/parents generation only knew ‘stars’ if they were in films, you wouldn’t have a high degree of recognition for most other walks of life so their death would largely go unmarked. The baby boomer era is now hitting 70+ so statistics say it’s only going to increase. By 2020 we will be ankle deep in ‘national treasures’ and people saying ’95 was no age at all…’. I’m going to have another pop later today to see if it was one of those sessions where nothing went right. Still early days but I don’t like the way PES can sometimes lock in to a position if you are top/bottom of the league. You might not regret that missing out abbeyhill as my season 3 finances meant I have very few options to play with in the PL. Another long-term PES scripting aspect is the way you’re never allowed to score two long-rangers in one match. Doesn’t really apply to PES2014, where it’s one or two per season, but in all other PES games I know that if I score one of my beloved long-rangers in a match, there’ll be no more allowed in that match, and probably not for a few matches after either. If I were the PES Builders, I would code it exactly the same way too. Good old Artur Boruc…only 50% possession yet beat Southampton 3-1 with an uncharacteristic PES keeping howler thrown in – the classic save low down where the knee’s momentum somehow pings the ball out of the hands and into the net. I think the cycle is broken.